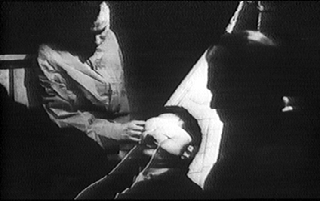 Chris Marker’s 1962 short film La Jetée (1962) is probably best known today as the inspiration for Terry Gilliam’s 1995 film 12 Monkeys. Some also consider it an influence on other popular time-travel films such as the Terminator series. Most serious critics acknowledge that Marker’s film is vastly superior to any of its imitators in its brilliant use of still images and sparse narration to construct a story which is both compelling and haunting. Indeed, an enormous amount has been written about Marker’s body of work and about this film in particular. In the face of this critical outpouring, it may be thought that nothing new or interesting could possibly be said about the film. In this brief essay, however, I wish to approach the film in a manner which I believe offers an interpretation not normally associated with it. I contend that La Jetée may be used to illustrate themes normally associated with Platonic theory. In making this claim, I am not suggesting either that this was Marker’s intention in creating the film, or that this interpretation is the only valid one. Instead, I am arguing that the film may consistently be interpreted in this manner and that such an interpretation enriches one’s appreciation of the film. Throughout this discussion, I will assume that the reader is familiar with the basic principles underlying the best-known elements of Plato’s “Theory of the Forms” as it is presented in dialogues such as “The Republic,” especially in his famous analysis of the “Myth of the Cave.” I shall also assume that the reader is familiar withLa Jetée. La Jetée begins with the description of a memory. That memory of an event which occurred “on the main jetty at Orly, the Paris airport, sometime before the outbreak of World War III” is described as “the only peacetime image to survive the war” (1). Following the war, the survivors retreat into caverns beneath the ruins where a small group of those who believe they were the “victors” oppress the rest. These rulers run involuntary time-travel experiments on their victims in order “to reach food, medicine, sources of energy.” As in Plato’s famous cave, the film presents us with a group of “men living in a sort of cavernous chamber underground” (2). These men are obsessed by their desire to obtain tangible wealth and power. They experiment on their prisoners in order to use time-travel as a device for possessing that power. In this way, the rulers, as embodied by their leader “the Head Experimenter” (Jacques Ledoux), are like the occupants of the cave who mistakenly view the shadows on the wall as the true reality, failing to recognize that they are mere representations of that which is truly real and valuable. They choose the film’s protagonist (Davos Hanich), simply referred to as “the man whose story we are telling,” because his obsession with a memory from before the war makes him an excellent candidate for successful time travel. We are told that earlier experiments failed resulting in disappointment, death, or madness. These earlier victims were not able to successfully time travel because they lacked the necessary innate capacity required for such exploration, namely an obsession with an internal image which is valued more highly than sensations derived from empirical experience. A peacetime morning. A peacetime bedroom, a real bedroom. Real children. Real birds. Real cats. Real graves. These “real objects” are clearly more significant than anything to be seen in the cave. They may be viewed as Platonic forms, ideal notions of the way bedrooms, children, birds, cats, and graves ought to be. In this film, these peacetime images (still, eternal, unmoving) are analogous to the images perceived by the soul in the realm of forms prior to the trauma of birth. Not everyone has an equal capacity to uncover these forms. Those who do must look within themselves dialectically to “remember” those glimpses of reality which they have within them. They are wise to the extent that they pursue the knowledge of these forms not in order “to reach food, medicine, sources of energy,” but for their own sake. The protagonist in the film never shares his rulers’ concern for material objectives. The one time he asks for a power source, when he visits the future, it is clear that he is simply parroting lines written for him by his masters. It is true that the man is initially overwhelmed by the “fabulous materials” which surround him when he enters the peacetime world on the thirtieth day, so much so that he loses track of his real goal, making contact with the woman he remembers from the pier at Orly. But, of course, this also happens to Plato’s philosopher who, upon initially being forced to leave the darkness of the cave into the light of the sun, finds “his eyes so full of its radiance that he could not see a single one of the things that he was now told are real” (3). In this perfect realm, there is no time other than the present. Platonic perfection, the true reality, is unchanging and eternal. They walk. They look at the trunk of a redwood tree covered with historical dates. She pronounces an English name he doesn’t understand. As in a dream, he shows her a point beyond the tree, hears himself say, “This is where I come from …” – and falls back, exhausted. The English name she pronounces must be “Hitchcock” for they are reenacting an exchange between Madeleine Elster (Kim Novak) and Scotty Ferguson (James Stewart) from the film Vertigo (Alfred Hitchcock, 1958). Recognizing this influence, Terry Gilliam inserts a more explicit homage to Vertigo in 12 Monkeys when he has his characters escape temporarily into a movie theater showing a Hitchcock retrospective. Awakening from a nap, James Cole (Bruce Willis) watches the tree trunk scene from Vertigoand immediately associates the story of those characters with his own. Moving back to La Jetée, while the woman sleeps, the man reflects that “in this world to which he has just returned for a while, only to be sent back to her, she is dead.” This is an odd way of putting things, as it is only in this world of the past that she would seem to be alive, not dead. This is confirmed by the fact that in the next line we are told “she wakes up.” However, if we accept the Platonic interpretation of these peacetime images, then the woman may be viewed as “dead” even in the world he is visiting. If that world is indeed the perfect and unchanging realm of forms, then nothing there is alive in the usual sense, as life implies the dynamic of change and the necessity of mortality. But the world he is visiting does not contain mortal creatures engaged in the activities of life. Around the fiftieth day, they meet in a museum filled with timeless animals. Now the aim is perfectly adjusted. Thrown at the right moment, he may stay there and move without effort. This scene is perhaps the strangest in the film. If he were actually visiting the past, then why would they go to a museum filled with stuffed animals? Why not visit the zoo and see living animals who breathe and move? Indeed, why would there even be such a museum filled with stuffed versions of animals who are not extinct? Furthermore, the woman herself is identified with these motionless creatures both in the statement that, “she too seems tamed,” and in the way the man observes her neck appreciatively in a manner similar to the way he regards the animals. From a Platonic perspective, the answer to these questions is clear. The animals and the woman herself are “timeless” because they are perfect beings, ideal notions of the true essences of such creatures. Having now proven that he has the capacity to uncover and appreciate the core elements of knowledge, the rulers decide he is ready to achieve their actual goal, the possession of a power source from the inhabitants of the future. The rulers in the cave are shortsighted fools, a fact reinforced by the need of many of them to wear strange-looking telescope-like glasses. Blinded to the truth by their desire for power, they squander the man’s ability to attain true knowledge in order to use him merely as a means to earthly powers. Once he makes contact with the inhabitants of the future, their recognition of these facts, and their superiority are made immediately evident. Up to this point in the film, the man has been the wisest person we’ve encountered. Only he has had the ability to discover truth within himself without risk of madness or death. But now, in the presence of the inhabitants of the future, he is the inferior one. Bathed in the bright light of their wisdom, he must wear sunglasses. For their part, the inhabitants of the future have no need to cover their eyes. In fact, they are shown with marks on the center of their foreheads, the traditional Hindu indication of a third eye turned inward towards self-discovery. He recited his lesson: because humanity had survived, it could not refuse to its own past the means of its survival. This sophism was taken for Fate in disguise. Those in the future recognize that the man has been sent by ignorant messengers concerned only with the shadows on the wall. Using a reference to the relativistic “sophists” of Plato’s own time, Marker makes clear that the idealists of the future reject the weak reasoning of those only concerned with worldly gain. They give the man a power unit not because they are moved by his arguments, but because they realize that the possession or lack of such material rewards is too trivial to occupy their thoughts. They give the cave dwellers what they want in order to be rid of them. If they deny this request, then undoubtedly the fools of the past would continue to pester them with irrelevant pleas. This ending, beautiful in its aesthetic symmetry, nevertheless raises various questions for my Platonic interpretation. Why do the inhabitants of the future grant the man’s request when they surely know what will happen to him when he returns to his past? If they are embodiments of Platonic wisdom then they must be completely good, yet how can it be good to send a man to his death? Indeed, why must the man die as the result of his seemingly moral desire to re-enter the realm of forms? In addition, how is it possible that a vision-impaired minion of the cave dwellers is able to enter the past formerly barred to him in order to carry out this execution? And, most importantly, if the world of the past is the perfect realm of forms where all is static and eternal, then how can an assassination (surely a momentous change) take place there? The answer to these questions lies in a realization of the nature of the man’s true desires, desires revealed in the narration’s description of the future as “pacified.” A true Platonic realm would of course be pacified in that it would be purely intelligible with no place for emotion or activity. Yet, at the end, the man is clearly motivated by passion, not intellect. In the last scene, when the man recognizes that he is finally in the location of his most vivid memory and that the object of his desire, the woman, is standing waiting for him in her assigned place, he loses all composure and runs towards her. His running is the most active visual impression of actual movement presented in the course of the entire film. This motion, and its strongly emotional motivation, make clear that the man is in fact not revisiting the Platonic perfect realm of essences. Instead, he has chosen what Plato would call the realm of the appetites, the very realm where the power of the cave dwellers is at their greatest. In our own time and culture, we may have elevated the search for romantic love to the level formerly occupied by the pursuit of selfless philosophical inquiry, but, following Plato, the inhabitants of the future have not. Having offered the man the greatest opportunity anyone could seek, namely the possibility of true wisdom untainted by emotions or desire, the future dwellers lose all interest in the man when he, like the others of his time, opts instead for feeling over intellect. Accordingly, the assassin is easily able to pursue the man into a realm much like his own in which all is determined by desire and apparent movement is accepted as the true reality. The poignancy of this story, as in traditional classical Greek tragedy, lies in the hero’s fatal flaw. Although intellectually superior to all others of his time, in the end he reduces himself to the level of his enemies when he chooses to discard the noble path offered to him by the future in order to wallow in a nostalgic illusion of adolescent romantic love. It is in this choice that the man resembles Scotty Ferguson (James Stewart), the protagonist of Vertigo, the film which Marker explicitly references in the tree trunk scene. Like the man in La Jetée, Scotty is obsessed by his memory of a mysterious woman who seemed the living embodiment of all his desires and dreams. He mistakenly believes this woman to be real and accordingly devotes himself to the attempt to transform a flesh-and-blood woman, Judy (Kim Novak), into his fantasy lover Madeleine. Just at the moment when the fantasy seems complete, the sight of her necklace breaks the spell. Finally recognizing that everything he sought was based on a hoax, Scotty is now compelled to destroy what he once most passionately sought. By forcing Judy to reenact her crime, he brutally crushes the Madeline identity returning her to the role of an accomplice in a sleazy murder scheme. Unable to cope with Scotty’s cruelty and rejection, Judy recoils in horror at the approach of the nun on the stairs and hurls herself to the same death imagined by Gavin Elster (Tom Helmore) for his fictional Madeleine. The last image of Vertigo, a haunting view of Scotty, arms akimbo, staring into the abyss, reveals the danger inherent in any obsessive attempt to actually live out one’s most private fantasy of the perfect romantic mate. Marker has cleverly remade this story in a manner which emphasizes similar themes while providing us with an equally haunting ending. Chris Marker, La Jetée: ciné-roman, Zone Books: New York, 1992 as found on the website http://cs.art.rmit.edu.au/projects/media/marker/Script-_La_Jetee_354.html. All other quotes from the script may be found on this site. Francis Cornford, The Republic of Plato, Oxford University Press, Oxford, 1945, p. 227. Sander Lee teaches Philosophy at Keene State College, New Hampshire. He is the author of Woody Allen's Angst: Philosophical Commentaries on his Serious Films (McFarland, 1997).